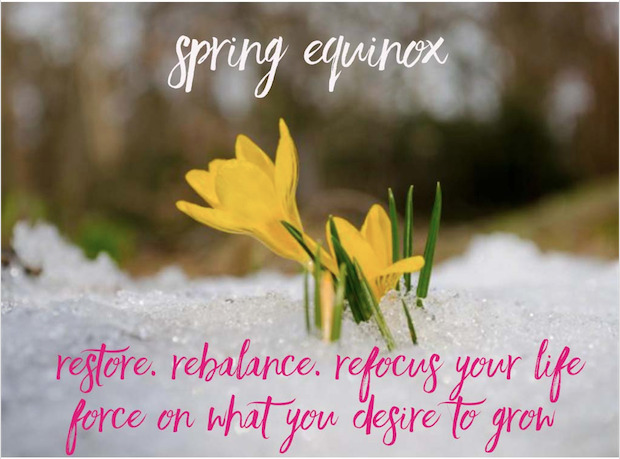 I love the arrival of Spring Equinox — the re-balancing point between the winter and the summer seasons that falls around March 21st in the Northern Hemisphere. Knowing that Spring Equinox will always show up for me — it’s never late and it never misses a year — gives me permission to take care of myself during the winter months, without guilt, and gives me the wisdom to know that I don’t have to jump on the mainstream new year bandwagon to start working out like a mad woman or to start cleansing in Jan or Feb at a time that is out of sync with what my body actually needs. Wisdom from many traditions tells us during the winter months our bodies are meant to take in heavier, more moist foods that keep us warm. It’s natural to crave sweets, be less active and sleep more (think bears hibernating). It’s also natural to put on a few pounds for extra insulation. If you observe nature during the winter, it’s dormant and slower. Wisdom Byte: If you want to have more balance & vitality, mimic mother nature. The itch you feel to make a switch as winter ends and spring begins is like Mother Nature’s telegram to you. And like any good mother, Mother Nature wants to love you into the shift, not criticize or shame you for the past, or bully or pressure you as way to motivate you into action in the now. She also wants you to do what is good for you, with compassion and commitment. Ignore the call to shift, keep plowing forward making no changes and then wonder why year after year your vitality decreases and your heaviness increases. Get down on or stress yourself for gaining weight over the winter, tell yourself what you have been doing during the winter is ‘wrong’ or ‘bad,’ which creates shame, guilt and pressure on the inside. So even if you diet, cleanse, make shifts, your action stem from a non-self-loving place and the shifts don’t stick, and you create more stress not less. Don’t fall into any of those self sabotaging traps. “Hi Honey… it’s Mama Nature here! Spring is coming. Just as I promised, every year I’m here with a reminder that it’s time to Spring Forward. Let’s reboot and reset your patterns, habits and rhythms so you will have the energy and clarity you need to create and operate this year with strength, focus, wisdom and self-love. Thank you for all you did to keep your body, heart, and spirit warm and cozy this winter. Now it’s time to take all that stored up energy in your physical space and transform it into fuel for your body, mind, and spirit. Then from this loving, nurturing, nourishing place, where you flow with the natural flow instead of pressure yourself to do some crazy diet or miss the reset all together, design what I call your personal “Spring Forward Reboot” — with the intention of making shifts that lead to increasing your vitality, strength and clarity to spring forward into your work, relationships and life in ways that sustain and support you to thrive. 1. Reset your rhythms in how you are working and resting — to harmonize with what is needed to support your work, relationships, and health going forward and to align with the increasing length of our days. 3. Reset your stress releasing soft addictions — so they don’t become strong addictions. 4. Reset your relationship with technology, with nature, and with the people you love — decrease tv, screen time, email, and internet and increase time in nature and with beings you love. It’s been a decade since I learned about and started accessing the power of Spring Equinox to live in harmony with the earth’s rhythm and every year I feel like I become wealthier and healthier because of it. I’ve seen an increase in my vitality, energy and ability to have more of the impact I desire without exhausting myself, because I set myself up at the start of Spring to sustain me and my work to be in harmony with the real and natural physical world. I still operate in our man made structures of technology and the marketplace, I just don’t let those run my internal operating system or life. Make it different each year based on what your body and spirit need at that time. Don’t do the cookie cutter, same-thing-for-all-people approach. Each of our physical and energetic systems are different and each year is different than the prior. Use it as an opportunity to deepen and strengthen your connection with your body, heart, spirit and Spirit. Really take a pause to check in with yourself physically and spiritually so you give yourself what you need. That’s not selfish, it’s conscious self care! Use it as an opportunity to become wiser about Ancient Wisdom + Modern Science — pick a new area of both ancient wisdom and modern knowledge to learn more about and try. I’ve studied Ayurveda, taken week-long retreats with Chi Gung masters, tried different cleanses to find what works best for my body and done Kundalini Yoga Intensives to release years of stored up stress. And that wisdom and the practices stays with me til this day. As Feminine Wisdom Teacher devoted to shifting this self sacrificing, unsustainable, stretched too thin reality we live in as modern women, every year I hold sacred space for others to take their year Spring Forward Reboot. Because I know it can be hard to hold that space for yourself. I’m headed to Mexico to lead a week-long Women’s Vitality Retreat called Harmonize with my partner Noah. I’ll be holding the 40-Day From Burnout to Balance Virtual Retreat for anyone to do from home. I hold personal 1:1 retreats in Valley of the Moon, California wine country And I’ll keep doing my own practice and reboot (I’m 13 days in as I write this). Practicing the art of the yearly reboot isn’t just some trendy notion. It’s a practice that gives us the power to create lives that sustain and support us vs drain us so we really can change this world without sacrificing ourselves. Self love + serving what we love. Both. Now that’s an equation I’m up for making a reality in this world. Together I believe we can. “Reboot Your System: Feminine Wisdom for Resetting Your Internal System at Spring Equinox” with Christine Arylo. Originally published at christinearylo.com on March 16, 2017.